Located north of the Capitol Rotunda is the richly decorated Old Senate Chamber. 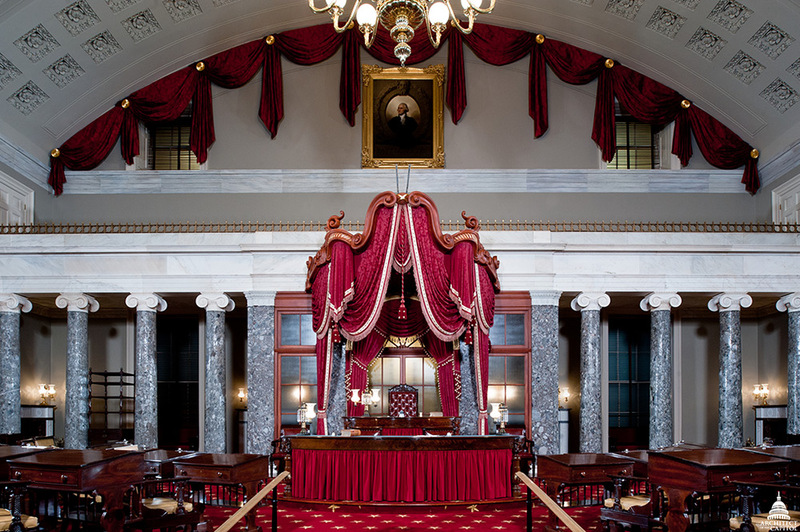 Designed by Benjamin Henry Latrobe, this room was home to the U.S. Senate from 1819 until 1859 and later to the U.S. Supreme Court from 1860-1935. 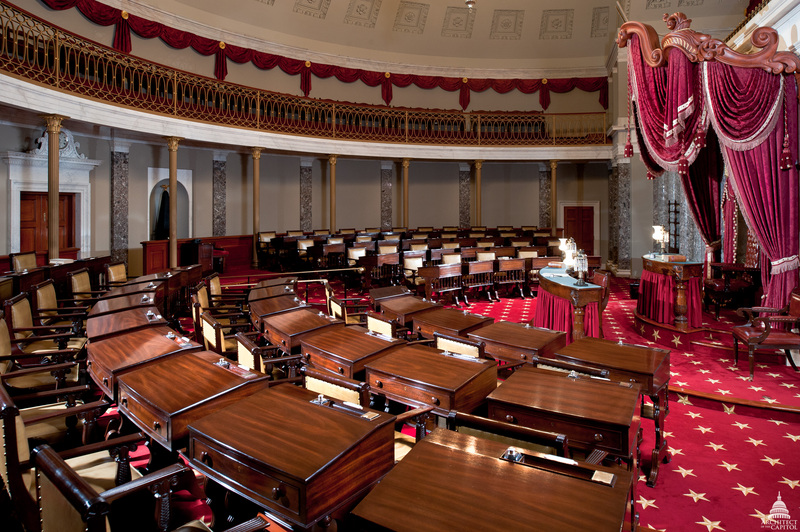 Today the restored Chamber is used primarily as a museum, recreating the scene of many significant moments in the evolution of the United States Senate and the legislative history of the nation. Located in the eastern half of the old north wing in the U.S. Capitol, the Old Senate Chamber is a semicircular room 75 feet in diameter covered by a half dome. It was designed by Benjamin Henry Latrobe and constructed by him and his successor, Charles Bulfinch, in 1815-1819. Latrobe modeled the chamber after similar rooms he had seen in Paris, which he considered ideally suited for hearing, speaking and seeing. He employed marble columns based on Grecian examples to support the visitor's gallery along the eastern wall. In 1828 Charles Bulfinch added a second gallery supported by slender cast-iron columns along the curving western wall. Modeled after the amphitheaters of antiquity, the two-story Chamber is semicircular in shape and measures 75 feet long and 50 feet wide. The ceiling is a half dome. Two visitors' galleries overlook the Chamber. The gallery on the east wall is supported by eight Ionic columns of variegated marble quarried along the Potomac River; they were inspired by the columns of the Erechtheion in Athens. A second and much larger "Ladies' Gallery" follows the curved western wall. It is carried on 12 steel columns encased in cast-iron forms with Corinthian capitals, which were designed to simulate the cast-iron originals. A wrought-iron balcony railing follows the contour of the gallery and is backed by crimson fabric that accentuates the decorative metalwork. Directly above the east gallery hangs an 1823 "porthole" portrait of George Washington by Rembrandt Peale, who had painted Washington from life. This portrait was purchased in 1832, the centennial of Washington's birth, for display in the Chamber. A curved table with richly turned and carved legs and a crimson modesty screen sits on a raised platform in the center of the room. This is the desk of the Vice President of the United States, who serves as President of the Senate. The desk is crowned as a place of importance by an elaborate canopy with a mahogany valence from which crimson fabric is hung. A carved gilt eagle and shield stand above the valence. Directly in front of the Vice President's desk, but one tier down, is a larger desk of similar design; this was occupied by the Secretary of the Senate and the Chief Clerk. A glass screen separates the Vice President's dais from a small lobby where Senators could go to relax yet still listen to floor proceedings. Two fireplace mantels are located on the east wall behind the screen; both are original to the Chamber. Two additional mantels on the north and south ends of the lobby are reproductions; the originals were replaced with stoves when the Chamber was converted for the use of the Supreme Court. Immediately behind the last row of desks is a low paneled wall that separates the Senators' space from a third visitors' area. Furnished with red-upholstered sofas, this area was reserved for privileged visitors who gained admittance to the Chamber through the special invitation of a Senator. Niches, one on either side of the main doorway, house reproductions of stoves that were capable of burning wood or coal. The crimson and gold color scheme seen in the canopy and modesty screens is repeated throughout the Chamber. Crimson drapery swags secured with gilt stars adorn the visitors' galleries. Window treatments use the same crimson material. The Chamber floor is covered with a carpet woven from long-staple, 100% virgin wool. It features a gold star pattern on a red background. The domed, white-painted ceiling of the Chamber is elaborately coffered and enriched by decorative moldings. A central, semicircular skylight is bordered by five smaller circular skylights; they originally provided the Chamber with natural light but are now artificially lit. Additional light was provided by a large brass chandelier made by Cornelius and Company, a prestigious Philadelphia firm, similar to the one now hanging above the Vice President's desk.